Tamu Ngina, Visual Artist. Priestess Heart. The Way of Oneness: Learn to have fun! as most of us know earth lost a wonderful son this past sept. 4, 2006.
and that nature and wildlife are important. as i do, it can be a very stressful situation to endure. well this morning i decided to walk to school with the kids as a great way to start my day. their school is well over half a mile away. have just snippet of the interview or at least babs on there talking about it. in her face, in her voice….it was intense. ms. walters asked her what does she miss the most about steve? 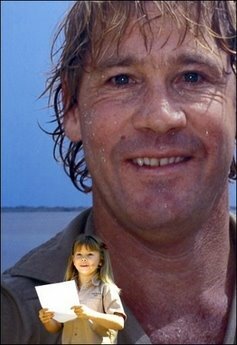 she also said something about she hopes soon that she will be able to have fun again because she is mrs. steve irwin and she has a lot to live up to. of course when she said that i just burst into tears. prior to that portion she mentioned that steve believed that if we each did our part in the world to help the world it would all add up. we have to each do our part.